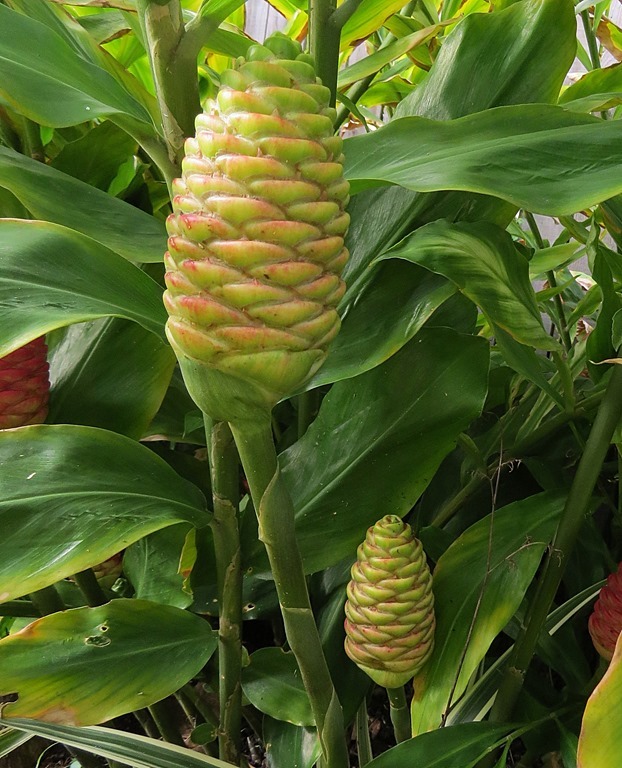 PineCone Gingers are also known as Zingiber zerumbet(botanical name),Shampoo Ginger,and even Awapuhi. 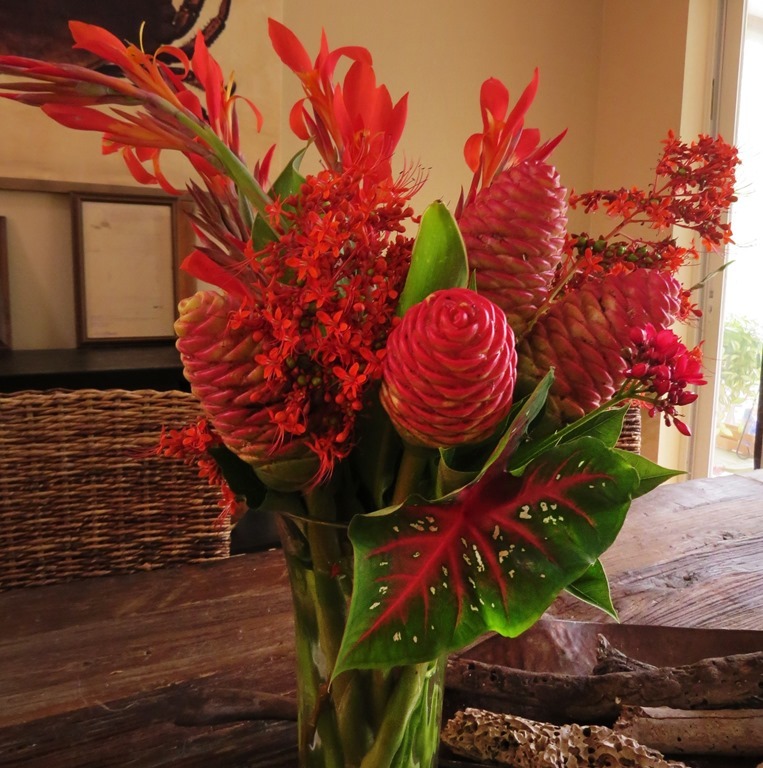 Just some palm fronds,Cinnamon Fern,and some leaves from the Cannas.Pretty good for a free floral arrangement and the house smells like ginger. 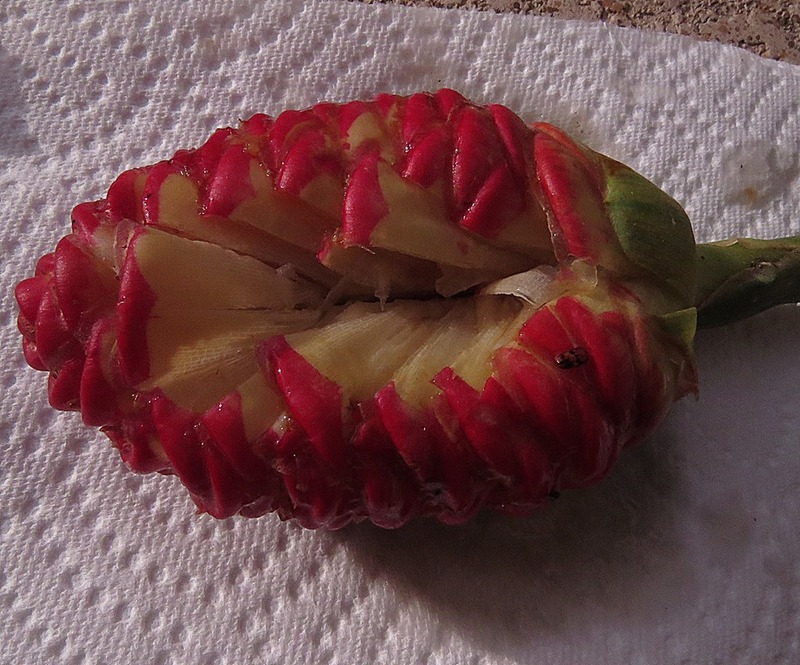 They are not a pretty plant. They tend to spread everywhere.And I am always digging up the rhizomes. 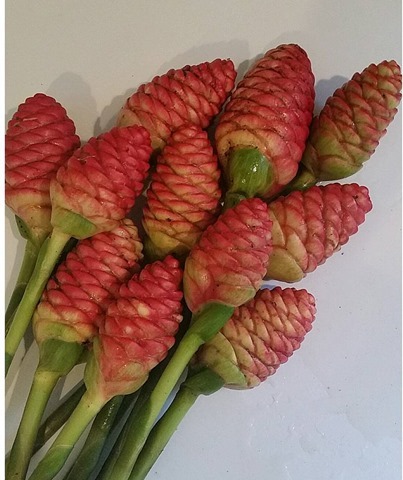 But they smell so good.Just like the ginger spice.And when you cut them open,you find this …..
Rub it on your skin,and it works like the best body lotion you can buy. These days,I’m not very happy……….. The sump pump on the septic system was over loaded with the last rain go-round and burned out. Seriously,it is.Your feet sink and squish when you walk anywhere. So I’m left with this…. 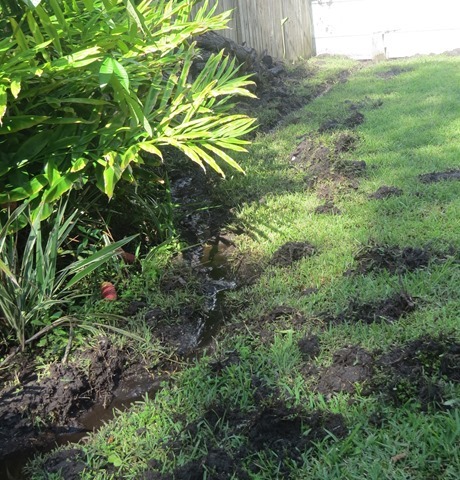 To drain water from the front yard. After the past few days,it still has water running through it. 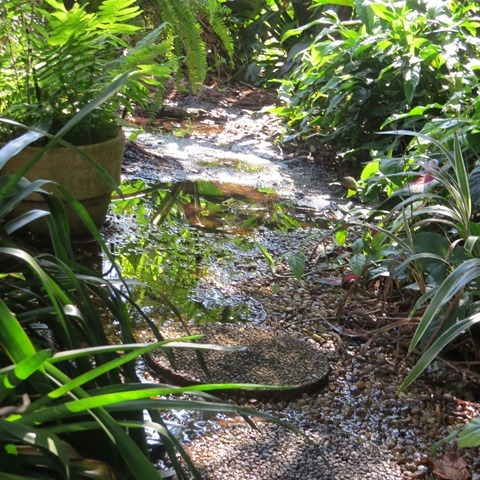 …which does work,but it is totally overloaded with the amount of rain we’ve had.I think hope it just needs more rock added to it.The problem is the ground is so saturated,there is no where for the water to go. Our lake has over come it’s banks,too,so the water just sits,until either the sun dries it up,or it can sink into the ground. But there are some bright spots…. It will be a deep purple. Even though they’ve been totally flooded out. And I finally gave in,and joined Instagram.I take so many photos with my cell phone,I needed to do something.I added a widget in the upper right,if you’d care to follow along. 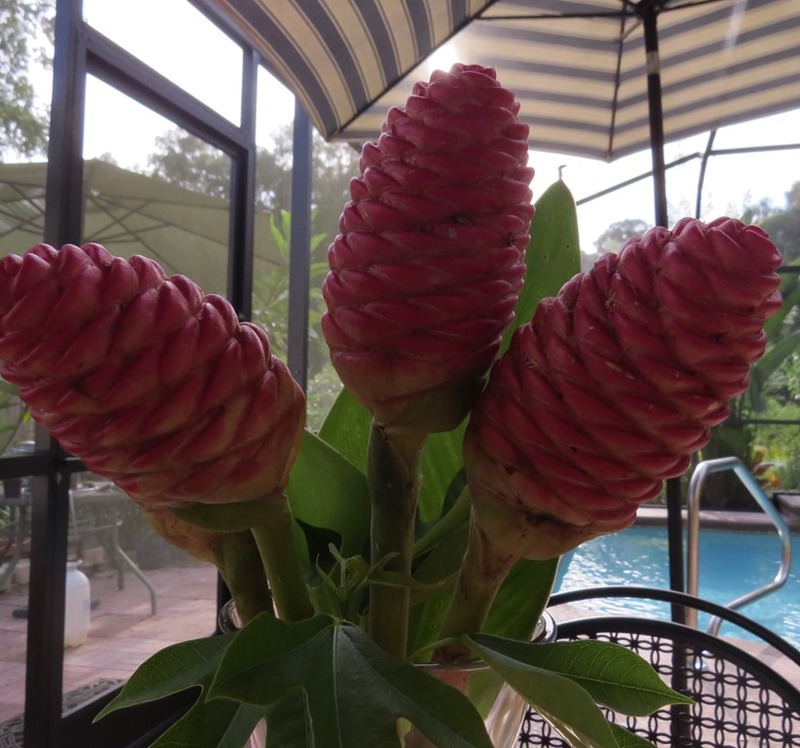 Now,it’s time for a glass of wine,and time to ponder all the digging that lies ahead…..
Officially known as Zingiber zerumbet,Pine Cone Ginger is a mainstay in Florida gardens.Most of us have received ours as pass-a-longs.As did I.From my neighbor. 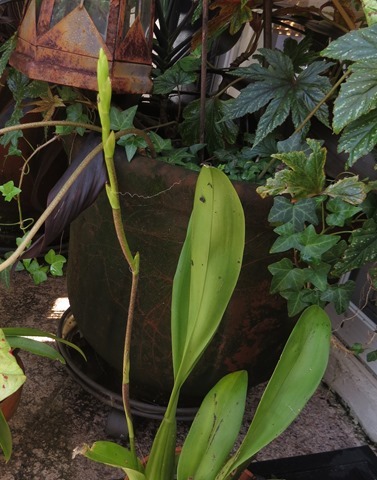 It is hardy from Zones 8-11,but has been known to be root hardy in 7B. 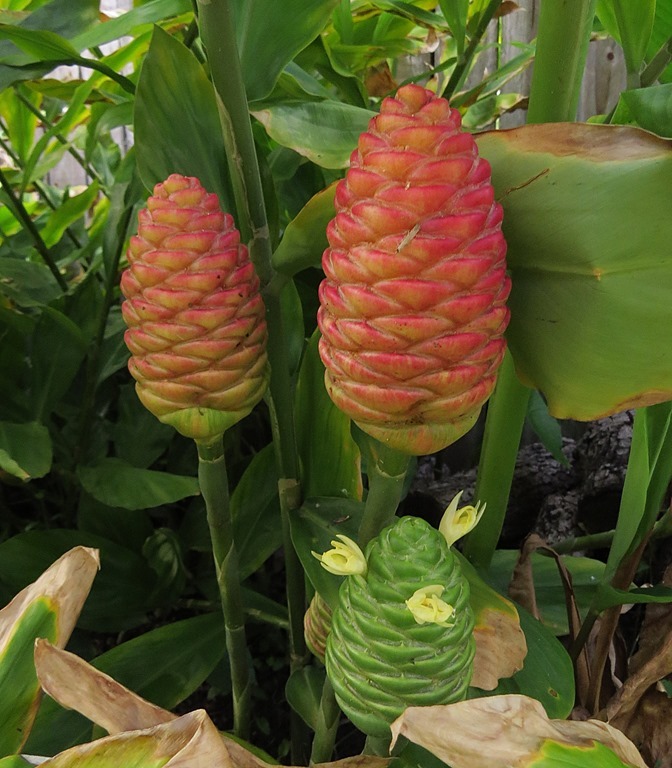 Late in August,the first stalks show up,with the cones that resemble pine cones…..
Later,the cones start to turn red…. 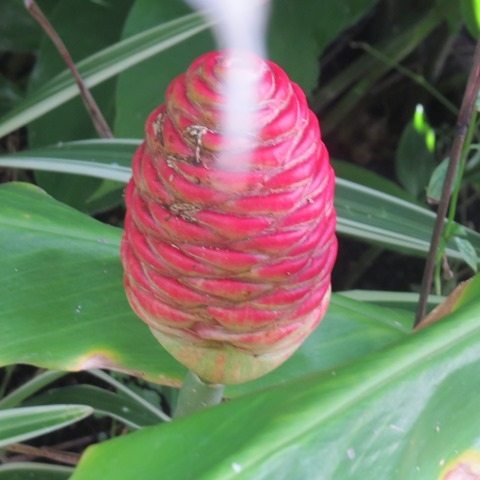 It is also known as “Shampoo Ginger” as it has been known to be used for shampoo.Hence it’s name Awapuhi. and you will find a milky fluid.I’ve never tried it as shampoo,but I have rubbed the fluid on a cut,and it has healed much faster than usual. 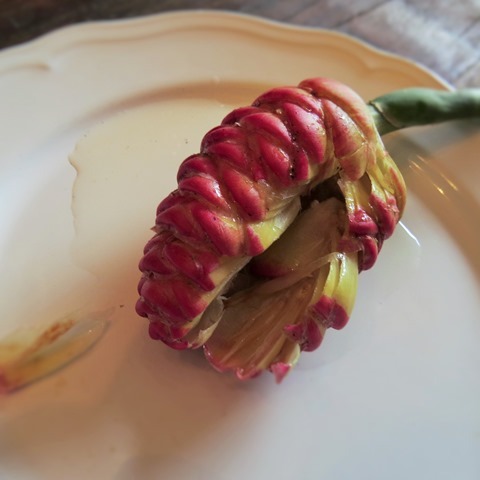 In a floral arrangement,they are a long lasting Autumn mainstay. These were cut over 2 weeks ago.And are still looking beautiful! 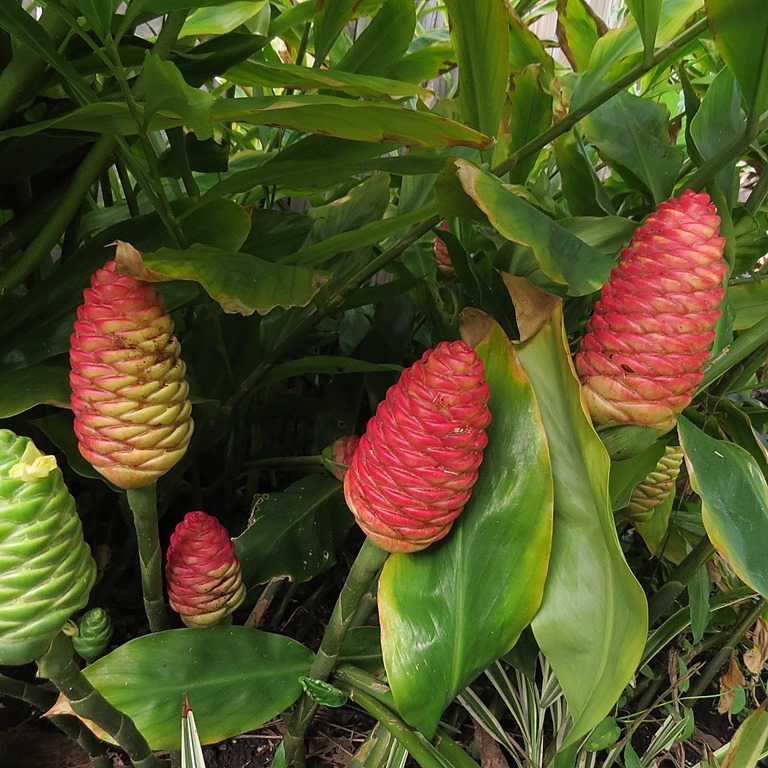 To learn more about Pine Cone Gingers,click here….. 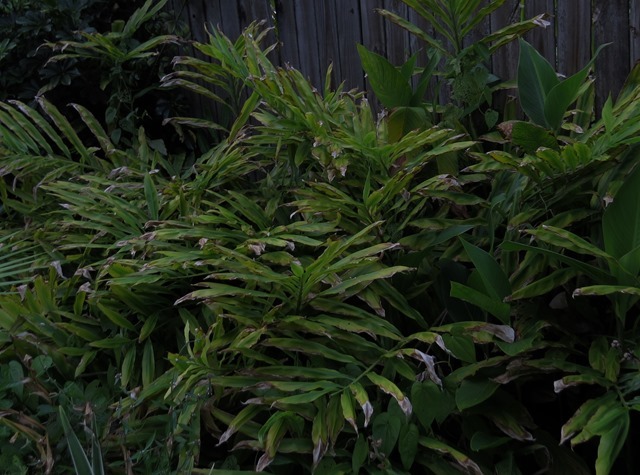 It is still summer in Florida,after all…..
Time to do some pruning. 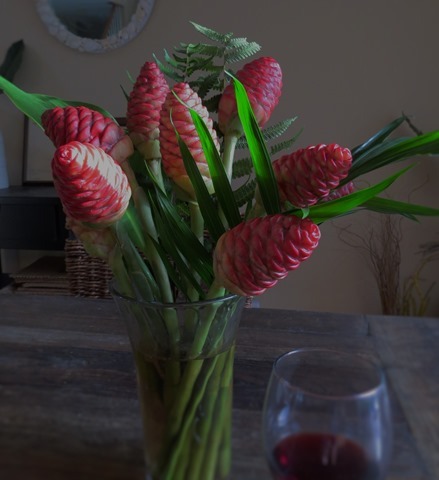 Make an arrangement for the table…. The lightning delay is over….